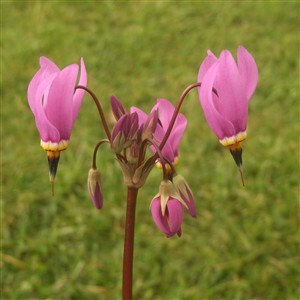 Dodecatheon jeffreyi (Sierra Shooting Star). A delightful North American plant that is easy to grow in a moist spot. Dark erect stems bear many Cyclamen-like flowers with swept back petals of a rich purple-pink in late spring and summer Each flower 'nose' is a bright yellow. Some native American tribes thought the blooms lucky and used them as a love charm.